Quick as a Bunny — a fast and easy Easter craft for all your bunnies! 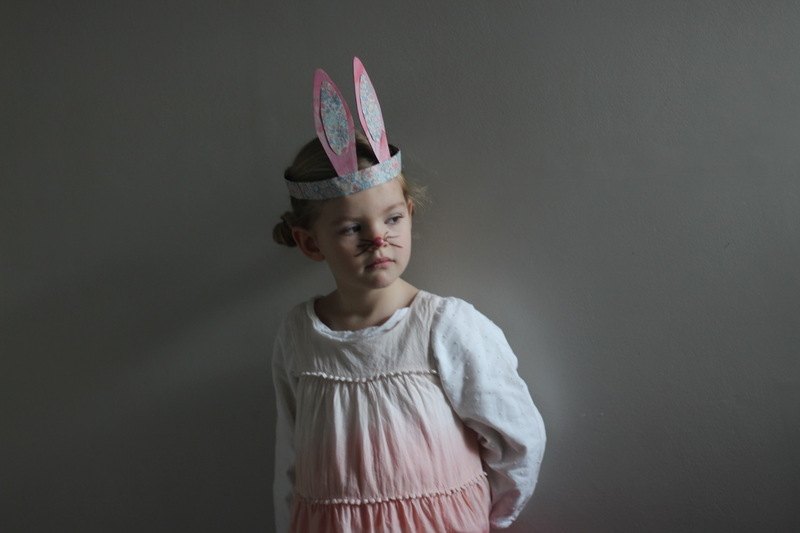 Hop into the Easter mood with these very simple and sweet Spring Easter Bunny Headbands. 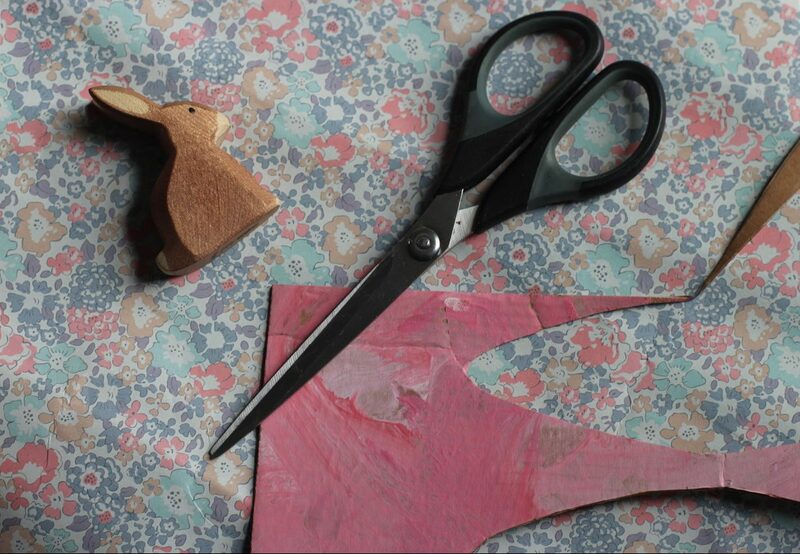 Using only paper and glue, they are 100% handmade, and fun for kids of all ages to make and wear. They take 5 minutes to make, so you can easily make them for a whole group of kids too! You can use an actual headband that goes thru the hair, but we found the band around your head stays on better for hopping, and also is easier to wear with glasses (which Beatrice normally wears). Also many children (like Joseph) don’t like how headbands can pinch behind behind his ears. Hence the alternative solution I have designed! Measure around the widest part of your child’s forehead where they would normally wear a hat. This is why wrapping paper was useful, since you will need a long piece of paper, and will want at least a 1.5″ thick paper band. If the paper is thin (ours wasn’t) then, double it or triple it up and glue together. If you have lovely ribbon or stretchy wide elastic you could try to replace the band with those, but we loved that this was an all-paper craft. Glue the back of the headband together, or use a stapler, or paper fastener. And of course a fluffy tail or some simple homemade non-toxic facepaint with whiskers and a pink nose will only make your bunny even sweeter. We simply used some of my pink lipstick and an organic eye pencil. 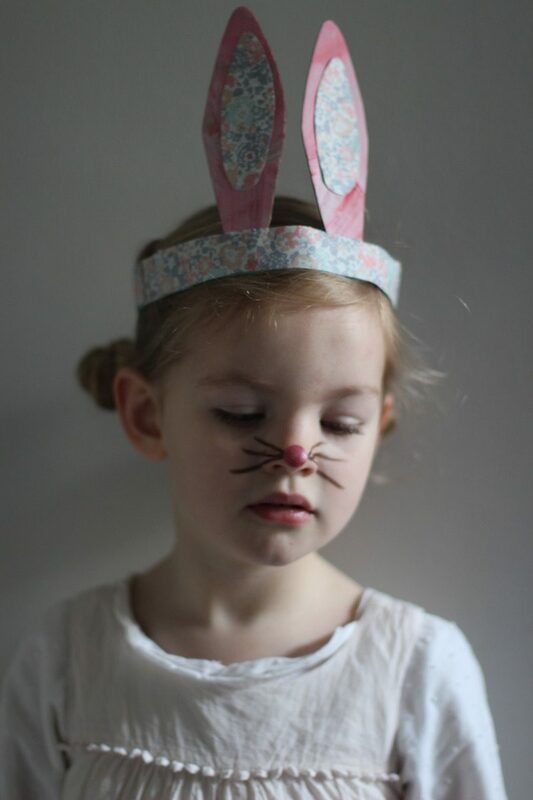 Hope these bunny headbands make you hop a bit higher for an Easter Egg Hunt, an Easter Bonnet Parade, or for a day of Easter baking and crafting. 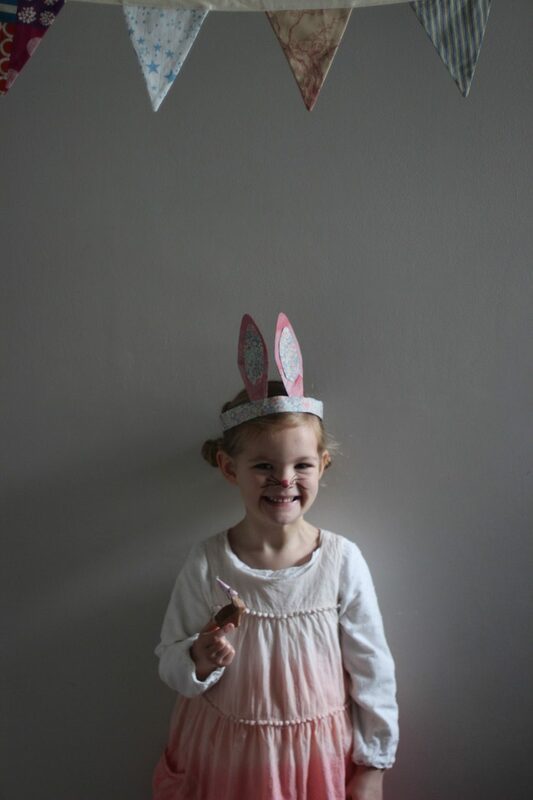 We love Easter and you can find more of our favourite posts here.